With Kevin Doyle suspended, and Shane Long's fitness sidelining him, Robbie Keane's strike partner remains uncertain for Ireland's trip to Talin this Friday. In a two legged affair, many managers would consider shutting up shop to settle for an equal home decider. Giovanni Trappatoni is not one of those managers. Trappatoni approaches every game in the same way. With question marks over his strikers' availability, the option of bringing in a fifth midfielder would potentially solidify the team's chances of "shutting up shop." Of course even the casual soccer fans understand that Trappatoni will not waiver from his 4-4-2 formation. A player like Stephen Hunt, Darron Gibson or Keith Fahey may have more experience than a Simon Cox or Jonathan Walters, but the truth is a five man midfield is not in Ireland's philosophy. While Cox has previously started, and impressed, for the national side, Jonathan Walters would be the better foil for Robbie Keane on Friday night. Keane impressed for LA Galaxy on Sunday before jumping on a plane to join the national squad. While he came through that fixture unscathed, one must question Keane's ability to play 90 minutes at full intensity after so much traveling coupled with his recent injuries. The likelihood is, Keane will at best play a quality 70 minutes before being withdrawn ahead of the second leg. For this reason, coupling him with Jonathan Walters up front is a smarter decision than playing Simon Cox. Cox's strengths are similar to Keane's in that both players are better suited to being support strikers opposed to leading the line. Playing between the midfield and forward line would take the pressure off of Keane as far as pressuring defenders and chasing lost causes. 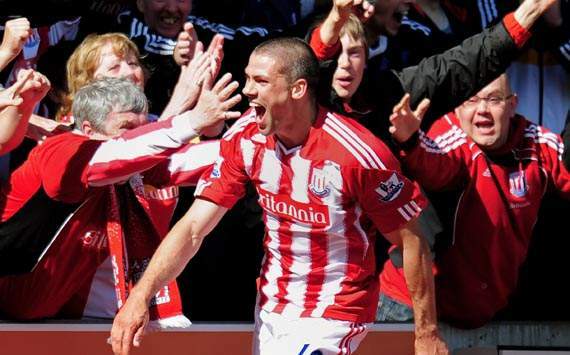 Leading the line and chasing lost causes is a specialty of Stoke City's Jonathan Walters. Walters has been very impressive for Stoke so far this season scoring three goals in 11 starts. His all around play has been more impressive than his goal scoring ratio with his robust performances and underrated quality on the ball. Walters would give Ireland a better outlet than either Cox or Keane. He does not need a perfectly precise pass to hold up the ball or bring other players into the game. In a first leg away from home, holding up play and bringing other players into the game will be vital for the side to retain possession and be competitive. Ireland have never been a short passing team, with Cox and Keane upfront together, they would need to change their whole style of play. Players like Glenn Whelan and Keith Andrews do not excel on the ball in link up play. Neither do Damien Duff or Aiden McGeady in truth. Getting the ball forward and putting in crosses is what this team's midfield is built for, as well as solidifying a strong defense, bringing Jonathan Walters in would replace a like for like striker in the absence of Kevin Doyle. Walters fits the mold of what Ireland are looking for heading into this crucial qualifier.